This year’s theme was inspired by the 2012 HCC cover design contest winner, “Crossroads”. Relating with this topic was effortless. Who has not been there, at the crossroads of our lives? I have, plenty of times, many more times than I have wanted. Life itself is made of choices, and we are constantly forced to make decisions. Therefore, I am convinced that any of us can relate with this theme: students, faculty, staff, and any person who peruses this magazine. 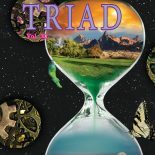 In this edition, TRIAD showcases a variety of non-fiction, fiction, poetry, photographs and art. All of the pieces were carefully selected from among a large number of submissions. If you are fortunate enough to find your artwork or literature chosen for publication, I want to congratulate and thank you for delighting us, the readers, with your gift. In addition, I would also like to express my gratitude to every single person behind the scenes who made this publication possible. I know firsthand how difficult, and sometimes terrifying, making decisions can be. For that reason, I want to give you strength and courage to confront any crossroad you come across. Because this particular time is very special to me, I want to invite you to come along and traverse this crossroad together. And now, without further ado, I have great pleasure in introducing to you the 2012 TRIAD. I hope you enjoy the journey! Dear Giannina, I’m interested in submitting some poems for Triad’s consideration. I teach at the Brandon campus, and have been published in the magazine several times in the early 90s. All submissions should be made to the Triad@hccfl.edu. Thank you for your interest. This entry was posted on November 28, 2012 by hcctriadme in Triad 2013.